Just wanted to point out that I have a new tab… RESEARCH OPPORTUNITIES. And, yes, that means I am off-and-running with my latest research study. 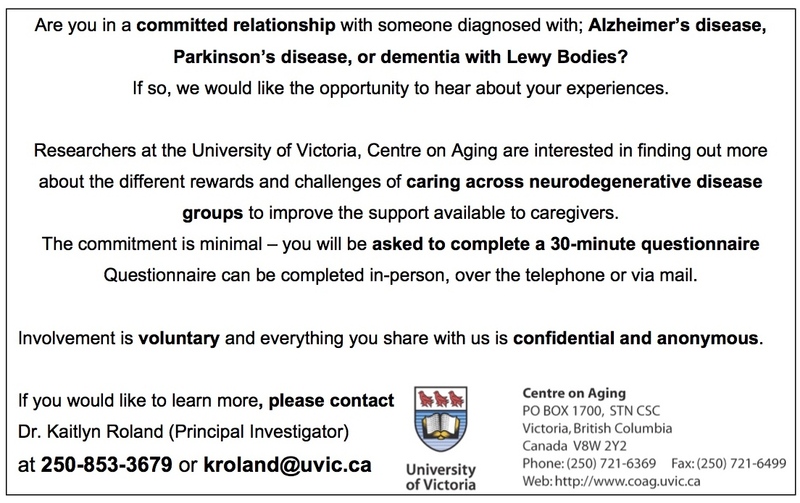 SO, PLEASE check it out if you are interested in getting involved – Specifically, I’m looking for care partners of persons with Alzheimer’s disease, dementia or Parkinson’s disease to fill out a questionnaire! *the 4 hours/week requirement could include basic housekeeping chores (laundry, dishes, cleaning), errands (shopping), transportation, cooking – I’m looking for people across all disease stages. Pretty simple, and you could be doing your part to better understands unique care needs and experiences across disease groups. … looking forward to hearing from you! much love. 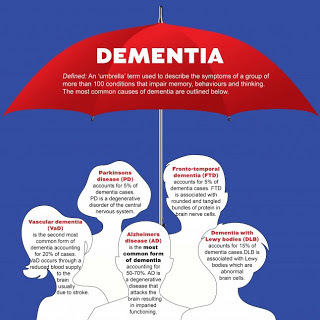 I want to start the new year off by clarifying some terminology around dementia. … meaning Alzheimer’s disease is a TYPE of dementia. Lewy Body Dementia is a TYPE of dementia. Dementia is not a specific disease. It’s a condition in which a set of symptoms exist that cause individuals to have difficulty functioning in their daily lives. These symptoms are related to thinking and to social abilities, and can include memory loss, impaired judgment and difficulty with language. The most common type of progressive dementia is Alzheimer’s Disease. Alzheimer’s is not a normal part of aging. Symptoms are caused by the destruction and death of nerve cells in the brain. Continued research is needed to determine exactly how and why the destruction begins. So, while Alzheimer’s is a type of dementia, not all dementias are related to Alzheimer’s. Symptoms may be similar, but it is important to obtain a thorough medical evaluation when dementia is suspected in order to determine the appropriate cause. Lewy body dementia is another type of progressive dementia. 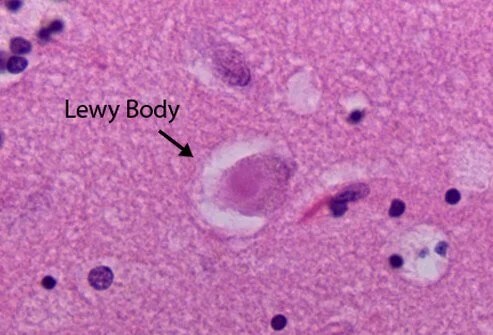 Lewy bodies are abnormal clumps of protein in the brain that can cause tremors and rigidity similar to Parkinson’s Disease; visual hallucinations; fluctuations between confusion and clear thinking; and rapid eye movement sleep behavior disorder, in which an individual acts out dreams. 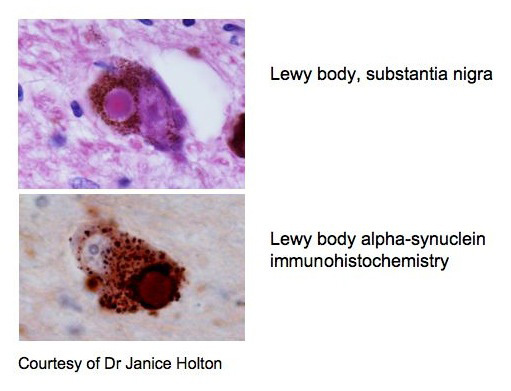 … If you’re interested in learning more about Lewy body dementias, check out this great video seminar from the LBDA Speaker’s kit “When it isn’t Alzheimer’s” HERE. More on this to come… much love. alpha-synuclein is a protein encoded by the SNCA gene. Although we are still not certain of what it does, we do know it makes up Lewy Bodies, clusters of proteins that are a pathological hallmark of Parkinson’s disease and other dementias (lewy body dementias). It is thought that in Parkinson’s disease, the variability in alpha-synuclein gene produces either too much alpha-synuclein protein or causes it to malfunction — which may be toxic to brain cells and to result in neuron dysfunction. Recent research developments include a chemical compound that slows down the onset and progression of Parkinson’s disease in mice. Griese and Griesinger in Gottingen have developed a substance which, in mouse models of the disease, reduces the rate of growth of the alpha-synuclein deposits and delays nerve cell degeneration. As a consequence, mice treated with this agent remain disease-free for longer than non-medicated controls. The current gold-standard, Levodopa, controls Parkinson’s symptoms by enhancing the function of the surviving nerve cells in the substantia nigra. This compound shows promise in slowing down the progression, according to their lab results; the earlier the onset of treatment, the longer the animals remained disease free. Another research effort looking to halt Parkinson’s disease progression involves GM1 glanglioside. GM1 impacts neuron plasticity, repair mechanisms, and neurotrophin release. A study published in November 2012 showed that GM1 ganglioside improved symptoms and slowed disease progression during a two and a half-year trial in persons with Parkinson’s. Dr. Jefferson, published in the Journal of the Neurological Sciences, followed 77 subjects over a 120-week period and 17 control subjects as comparison. GM1 group had significant improvement in UPDRS motor scores and maintained much of the initial benefit of GM1 treatment, (i.e. showed relatively minor symptom progression compared to patients using standard anti-Parkinson medications). However, nonmotor (i.e. pain, sleep difficulties) and psychological (i.e. apathy, depression, hallucinations) symptoms can also occur. What distinguishes PDD from other forms of dementia is that it develops at least 1-2 years after classic parkinsonian motor signs are evident. If the opposite it true (i.e. dementia signs first, then motor signs), it is recognized as dementia with Lewy Bodies. PDD is mainly attributed to an accumulation of a protein, Lewy Body, in the brain. 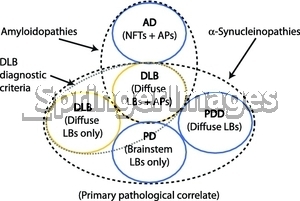 There is overlap in both pathology and symptoms in the many forms of dementia, and this can make diagnosis difficult! In PDD, people usually have major problems with attention, executive functioning (i.e. how to sequence actions and perform tasks), and memory retrieval (i.e. recalling information from your long-term memory). Whereas in Alzheimer’s disease, the memory problem is more often storing memories. More and more research is being done to understand this tangled web of dementia pathologies and symptoms, especially to help with accurate diagnosis… but what are the implications for the PD caregiver? much love.